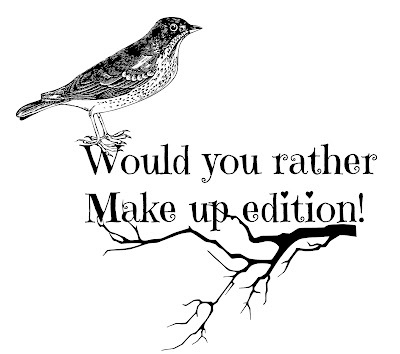 Would you rather – Makeup Edition! I saw this tag, over on bellamomento blog, and it seemed like a lovely tag to do, Make sure you go and check her blog out because her blog is simply amazing! I would have to say Palettes and eyeshadows, for school I don’t really wear eyeshadows so I would let them go. Even though I love long hair, I don’t think I would be able to NEVER have to cut, I would have all my hair cut off, but only if I was aloud to grow it again. Pink cheek, I think its a lot more natural, and easy to work with, plus I never wear a coral cheek. This one is easy, I would buy clothes, because you can never have to many clothes! Eyeliner as lipstick, because you can get different colour eyeliners so you could wear different ones, but lipstick as eyeliner, would make your eyes sticky and horrible. Seeming we only have Mac in England I would say Mac, but if we did a Sephora I would shop there because there are way more brands at sephora. One Lip colour, because I like trying new eye looks, but I only really wear my tinted lipgloss. Winter clothes in summer, but you would freeze here in winter if you wore summer clothes, plus in England we don’t really have much of a summer so, winter clothes would be fine. I would wear bright colours, because it makes your outfit more fun and dark nails are boring to have all year round. Eye product, but then I would find a new favourite. Ponytail, I don’t like wearing my hair up, but when I do its in a high ponytail. Never wear lip gloss, I hate the feeling of lip gloss, its all sticky and horrible. I hate the look of drawn on eyebrows, so I would say shave eyebrows, plus because I’m blonde you can’t really see my eyebrows anyway. I’m not sure who to tag, so If you feel like you want to do this tag, Then I tag YOU!